Just few more hours remaining for the opening episode for asianet bigg boss malayalam reality show. 16 housemates aka contestants will be announce today. asianet will air the opening episode at 7.00 p.m , telecast timing of the show can be check from here. every monday to friday at 9.30 p.m and saturday to sunday at 9.00 p.m is the telecast timings. comedy stars season 2 shifted into sunday time slot. there will be repeat telecast of the show every day, we will update about the same here soon. there is no official info available about the contestants of the show. unconfirmed named spreading in social media other other web pages about the housemates profiles. we can wait few more hours for the official declaration. we will update about the same here once it declared by the channel. 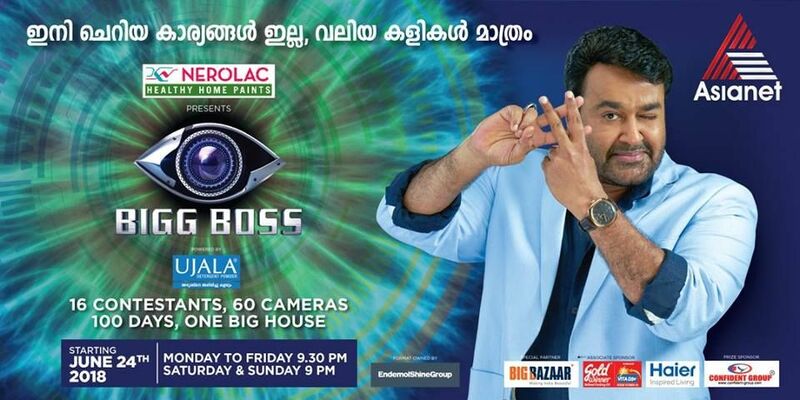 latest episodes of malayalam bigg boss will be available through hotstar application. asianet expecting better trp ratings for the show, because of mohanlal. he will be on saturday and sunday episodes of malayalam bigg boss show. as per current info asianet will air the show 9.00 to 10.30 p.m every weekend. every monday to friday it will be at 9.30 p.m to 10.30 p.m.
asianet bigg boss malayalam reality show will be a special experience to malayalee television viewers. the most popular malayalam actor is hosting the show, it’s on most popular malayalam tv channel. as per latest barc ratings asianet is leading the chart. we have published a complete trp 2018 of malayalam tv channels. last week they have a drop of around 300 points in total, it’s because of the channel not available in asianet cable vision. fifa 2018 with malayalam commentary on sony espn getting better ratings from kerala. stay tuned here for more updates of malayalam bigg boss show. all the best to the contestants of malayalam bigg boss show.